Weak, reckless, incompetent -- and that's just what Republicans are saying about Romney. Lehman moment … not ready for prime time … wasn't presidential … utter disaster … incompetent … completely bungle it … just trying to score a cheap news cycle hit. Romney looked weak today....And I thought, "He looks like Richard Nixon." --Peggy Noonan, conservative columnist and speechwriter for Ronald Reagan. The Romney campaign's attempt to score political points on the killing of American diplomats was a dismal business in every respect. …it was graceless and stupid as a matter of politics. As tortured in its reasoning as it is unseemly in its timing. Not much is required of Gov. Romney on this. He has to be poised. He has to be sure-footed. He has to be precise. He was none of those. Frankly, the charges he made were not only completely untrue but reckless and irresponsible. The Romney campaign put out a statement before the facts were in that politicized the matter and gratuitously attacked the administration for something they did not do.…They acted too quickly, too rashly, too politically. He had forgotten the first rule in a crisis: don’t start talking before you understand what’s happening. Romney should be standing as an American with Americans right now and not trying to narrowly pursue political profit. He’s just an ambitious man. Nothing wrong with that, except when you want to be president. The contrast he set with Obama was not good. ROMNEY: Foreign policy is serious business, but here's my approach anyway: The President is too weak to deal with our biggest enemy _______________. FILL IN THE BLANK: China, #1 foe Russia, Iran, Hugo Chávez, immigrants. Click here to view the image. Tweet it! 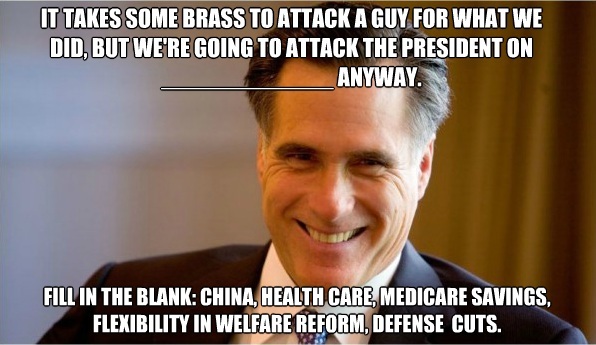 ROMNEY: It takes some brass to attack a guy for what we did, but we're going to attack the President on _______________ anyway. FILL IN THE BLANK: The speed of the economic recovery, China, the free rider fee in Romneycare, Medicare savings, flexibility in welfare reform, "red line" on Iran, defense spending cuts, and the Tea Party Downgrade of the U.S.'s credit rating.